When customers purchase products, the first thing they touch is not the product, but the packaging.The information on the surface of the package determines whether the product is worth buying. Just like when we go to the store to shop, we will choose the brand products we approve through the brand information on the packaging surface. Or make our purchase decision through the content description of other packaging surfaces, product stories, product features, etc. We also prefer packaging that is simple in design and environmentally friendly. We can provide you with professional packaging design advice to help you better improve your packaging solutions. Paper tube packaging reduces waste by means of degradable or reusable, recycling, etc., which is in line with the needs of packaging development. And black cardboard paper tube food packaging has become very popular, and many brands use this simple packaging method. The surface of the adhesive paper can be black kraft paper, single black paper, black imitation leather paper, black imitation cloth paper, or even more materials. Using different materials, the visual perception and the touch of the surface are completely different. The logo on the surface of the package is printed with bronzing printing. The contrast between gold and black forms a clear color contrast, which is more conducive to highlighting the brand. To judge the most important factor of paper tube food packaging, the coiled tube has no crimped creases, and the top cover and bottom are smooth and flat. High-quality product packaging can bring out the value of the brand. 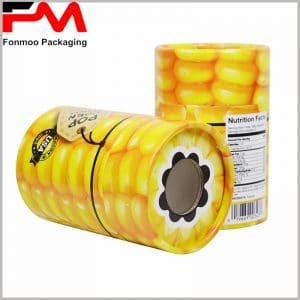 More types of food packaging, cardboard round tube packaging or rectangular packaging, we can provide you with free packaging design guidance. I like this simple packaging design, LOGO uses hot stamping to clearly highlight the value of the brand.